The frame for the Cobra is a work of art. The suppliers definitely flexed their quality muscle when they designed and built the frame. This frame closely resembles the original. Obviously it won't be exactly the same or it wouldn't be a replica. The frame is shipped pre-painted with a black enamel. There is also a Jet Coat option available. For more pictures check out the Aluminum section. We just started putting some of the front suspension components together. The kit comes standard with coil over shock for the front. The rear will incorporate Mustang components. We have opted to upgrade the rear shocks to KYB units. The pictures below are missing the lower A-arm, spindle and hub. Theses parts are currently on order. The wheels that I decided to go with are not authentic to the AC Cobra period (1965). I decided to go with a modern looking rim. This gives is a updated look while also making the latest high performance tire sizes readily available. 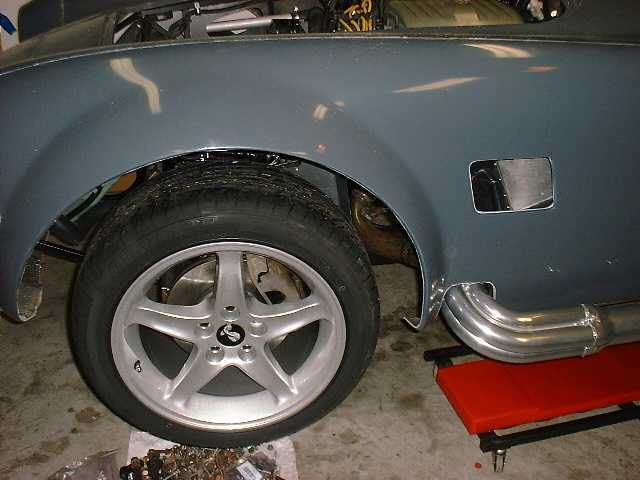 I am using a Mustang Cobra R style rim that measure 17 inch diameter and 9 inches wide. The rim is made of cast aluminum and is a 5 bolt pattern. I bought 2 different offsets for the front and rear rims. I bought a set of 6.95" offset and a set of 5.42" offset rims. For more info on offsets Click Here (this link is to the TireRack.com web site). The rims will be fitted with 235 x 45 x 17 in the front and 275 x 40 x 17 in the rear. I decided to try Dunlop SP 5000. I purchased them from Discount Tire Direct. 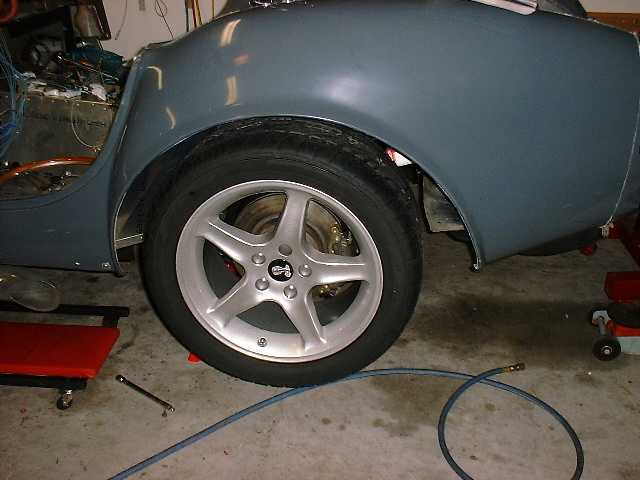 With the tires and rims mounted on the car and it on the ground we have to readjust the clearance.